In what can rightfully be described as a “basket of deplorables” being offered up to lead the Trump administration, Sen. Jeff Sessions (R-Ala.) stands apart. And we are going to have to unite to stand up against the nomination of Sessions to be attorney general. Rashad Robinson, executive director of Color Of Change, said in a statement, “There’s no other way to say it: Jeff Sessions is a racist. He has opposed the Voting Rights Act. He has taken extreme views on immigration and free speech that threaten black communities and other communities of color. 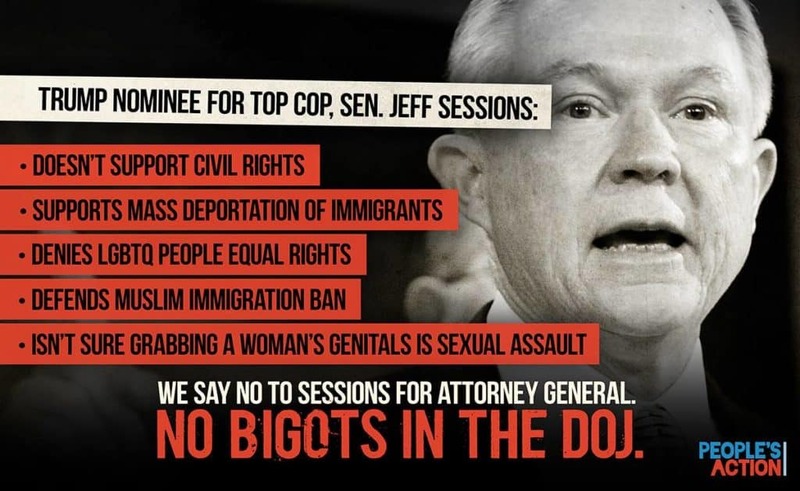 He makes jokes about the Ku Klux Klan and referred to a black federal prosecutor as “boy.” As attorney general he represents a threat to the legal rights of black people across the country, and the Black prosecutors and civil servants he will oversee in the Department of Justice. The Huffington Post reminds us in a headline that “Jeff Sessions Was Deemed Too Racist To Be A Federal Judge” – in 1986 by a Republican-controlled Senate. Since then, Sessions has voted against covering LGBTQ people under federal hate crimes laws and against marriage equality, has opposed a path to citizenship for undocumented immigrants, supported the 2013 Supreme Court decision that weakened the Voting Rights Act and supported Donald Trump’s plans to ban Muslims from the country. The nomination of Sen. Jeff Sessions as attorney general is one more way the Trump administration shows its racist, xenophobic, homophobic and misogynist colors. His track record through more than 40 years in government has been consistent, from his statement as an Alabama state’s attorney in the 1970s condemning groups like the NAACP for having “forced civil rights down the throats of people” to his extreme position as a United States senator against a path to citizenship for undocumented immigrants to his votes against marriage equality and protecting LGBT people against hate crimes. “Amid a series of ominous appointments, naming Jeff Sessions as attorney general is especially pernicious because that office is our most important federal bulwark against the forces of bigotry and hatred that affect communities of color, immigrants, Muslims, women, the LGBT community and people with disabilities. At a time when the principle of equality under the law is under attack on so many fronts – including the right to vote – we cannot accept Sessions or anyone of his ilk to lead the Justice Department. This is a direct threat to our communities, and we will be activating our national network in the coming days in uncompromising opposition to his nomination. We call on our allies in Congress to do the same.